Echinoderms are a group of marine animals that includes more than 7,000 different species, sea lilies, sea urchins and starfish being the most common and most well-known members. No member of this large and diverse group is able to survive on land or in freshwater habitats, but they are very widespread in marine habitats and can be found in salt water all over the world. They prefer coral reef habitats and shallow waters, but they are quite common in deep waters and around the poles as well. 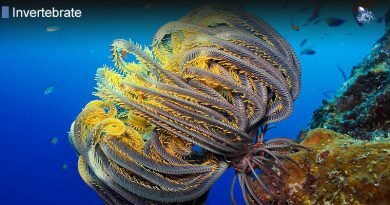 Most of them live on the sea floor and are sedentary animals, but some of them, such as some sea lilies, are able to move fast over short distances, changing place often. Some sea urchins are known to be free-floating all their lives. The name of these special animals means spiny skinned in Greek. Though not all of them have spines, most of them have textured, often very rough skin. The species that do have spines are usually poisonous, the spines releasing a toxin as a means of defense. All echinoderm species have symmetrical bodies, with five or a multiple of five equal sections distributed around a center. 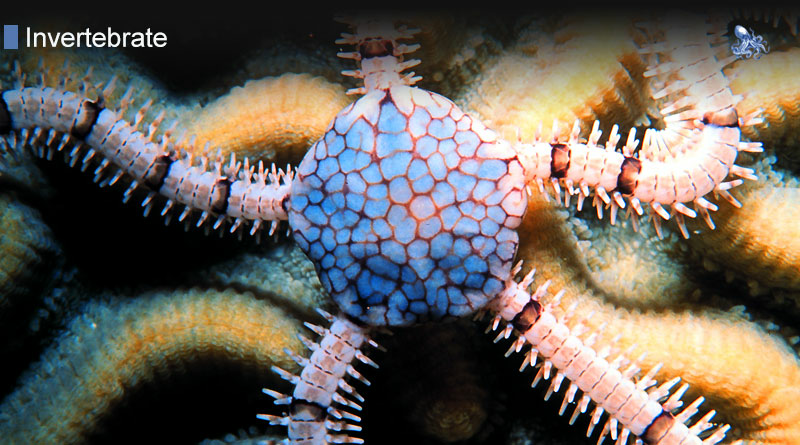 In some species, such as brittle stars, the sections have transformed into arms, each of them being equipped with a set of internal organs of their own. Though most species of this group have very fragile bodies, they have an extraordinary capacity for regeneration, being able to re-grow their lost sections, even their organs. These creatures have no brains, only a rudimentary nervous system. They have no eyes either, but some species, notably starfish, have light-sensitive organs on their extensions. Being such a large and varied group, the species belonging to the taxa adopt varied feeding techniques. 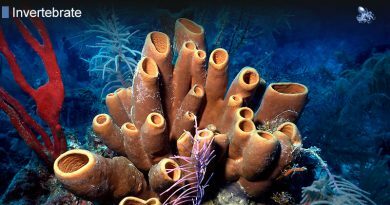 Some of them, such as crinoids, are filter-feeders, others, such as starfish are carnivores and detrivores, feeding on small fish or the particles of dead animals. Some of them, such as certain species of star fish, use a very peculiar method during feeding: they practically eject their stomach through their mouth into their prey, then they release digestive juices into the prey, dissolve the prey, then retract their stomach that already contains the liquidized prey. Most echinoderm species reach sexual maturity at the age of 2 or 3. Females release eggs into the water, while males release sperm and the fertilization of the eggs by the sperm takes place in the water. The reproductive activity is often synchronized, multiple individuals being active at the same time, thus increasing the chances of successful fertilization. There are three species of brittle stars, three species of sea stars and one species of sea cucumbers that are known to engage into internal fertilization and there is one sea star species that reproduces asexually, by parthenogenesis, developing embryos from unfertilized eggs. Young echinoderms (the larvae) go through a number of development stages before they become adult individuals, but no matter which stage they are currently in, they are always symmetrically shaped.